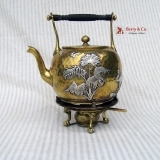 American brass kettle with applied sterling silver birds and palm branches in Japanesque style, Gorham Silversmiths, date marked for 1883. This beautiful kettle is 10 3/4" tall, 7 7/8" across the spout. Slight wear to the silver decorations as well as brass patina. 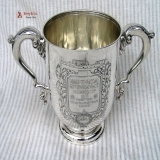 American sterling silver trophy made by Tiffany & Co in 1917 and presented to: Miami To Nassau Motor Boat Race Columbus Cup 1917 Presented by The Development Board Bahamas. Expulsis Piratis Restituta Commercia BAHAMAS. This beautiful cup is 8 1/2" tall, 13 3/8" across the handles and weighs 1637 grams or 52.6 ozs Troy. The soft, warm, original finish is present, with no buffing or machine polishing. The excellent original condition and clear, crisp detail, with no monograms or removals, repairs or alterations, make this an especially attractive offering. 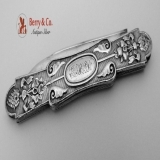 American sterling silver (all silver) folding pocket or fruit knife with embossed fruit and cone decorations, c.1870s. This beautiful knife is 5 1/4" long unfolded, 3 1/4" folded and weighs 28 grams. Monogrammed EHD in an ornate period script. The soft, warm, original finish is present, with no buffing or machine polishing. The excellent original condition save for a couple minor dents consistent with age, clear, crisp detail, with no removals, repairs or alterations, make this an especially attractive offering. American sterling silver serving spoon with naturalistic clam bowl, high relief Repousse handle, Gordon & Co, Baltimore 1870s. 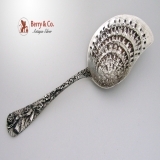 The unusual spoon is 10 1/2" long and weighs 143 grams or 4.6 ozs Troy. Monogrammed G in an ornate period script on the back of the handle. The soft, warm, original finish is present, with no buffing or machine polishing. The excellent original condition and clear, crisp detail, with no removals, repairs or alterations, make this an especially attractive offering. American sterling silver napkin ring with applied floral and scroll borders, Wallace, c.1900. 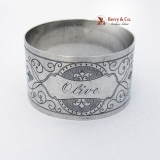 This beautiful napkin ring is 2" in diameter, 1 1/4" tall and weighs 36 grams or 1.16 ozs Troy. The soft, warm, original finish is present, with no buffing or machine polishing. Monogrammed HC in an ornate period script. The excellent original condition and clear, crisp detail, with no removals, repairs or alterations, make this an especially attractive offering. 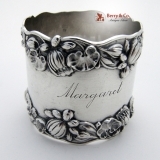 American sterling silver Art Nouveau napkin ring in the Pond Lily pattern by Gorham Silversmiths, B209 c.1890, with an ornate, period script monogram Margaret. 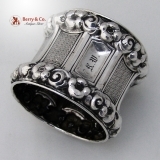 This elegant, ornate napkin ring is 2" in diameter, 1 3/4" tall and weighs 49 grams or 1.6 ozs. Troy. Monogrammed as described above, the soft, warm, original finish is present, with no buffing or machine polishing. The excellent original condition and clear detail, with no removals, repairs or alterations, make this an especially attractive offering. American Art Deco pair of napkin rings by Saart Bros, c.1935. 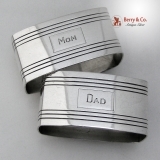 These elegant napkin rings are 2 1/8" long, 1" wide, 1" tall and weigh a total of 59 grams or 1.9 ozs Troy. Incribed Mom, Dad. The soft, warm, original finish is present, with no buffing or machine polishing. The excellent original condition and clear, crisp detail, with removals, repairs or alterations, make this an especially attractive offering. American sterling silver Art Nouveau napkin ring by Gorham Silversmiths, c.1900, pattern # B2598. 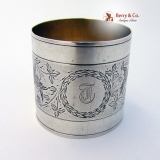 This attractive, double walled napkin ring has floral and swirling foliate decorations that form three round reserves, one of which as a period monogram: G.B.H. 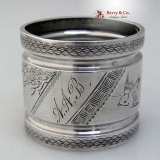 Weighing 27 grams, this attractive, ornate napkin ring is 1 5/8" in diameter and 1 1/8" tall. Monogrammed as described above, the soft, warm, original finish is present, with no buffing or machine polishing. The excellent original condition and clear detail, with no removals, repairs or alterations, make this an especially attractive offering. 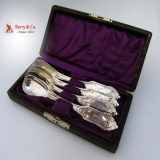 English sterling silver 3 piece youth set with beautiful unique decorations on the front and the back of each utensil, date marked for London 1852 Chawner & Co, George William Adams. 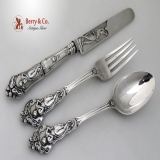 This beautiful set measures: the all silver knife is 8 5/8" long, the fork is 6 3/4" long and the spoon is 6 7/8" long, total silver weight is 185 grams or 6 ozs Troy. The soft, warm, original finish is present, with no buffing or machine polishing. The excellent original condition and clear, crisp detail, with no monograms, removals, repairs or alterations, make this an especially attractive offering. 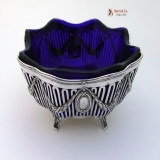 German 800 standard silver open work footed 8 lobed serving bowl with a blue cobalt glass insert by Gebruder Friedlander of Berlin, Germany c.1900. This exquisite, classical revival style bowl has a bod y of open work ovals with applied wreaths and blank oval plaques sitting on four Acanthus leaf strap work feet. The fitted cobalt glass insert is in excellent condition, with no cracks, chips, nicks, etc. With a silver weight of 301 grams or 9.7 ozs. Troy, this useful and attractive bowl is 7" in diameter and 3 3/4" tall. The soft, warm, original finish is present, with no buffing or machine polishing. The excellent original condition and clear, crisp detail, with no monograms, removals, repairs or alterations, make this an especially attractive offering. American sterling silver and glass liquor flask by Gorham Silversmiths, c.1905. 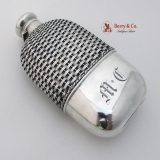 This truly elegant flask has a sterling basket weave top frame and a sterling removable bottom cup with a gilt interior. The cap hinge is clean and tight and the lid closes securely and without leakage. One side of the removable cup has an ornate, period monogram: M â€¢ C and the top of the cap is inscribed: 1905. The cup weighs 57 grams and the total weight of the flask is 378 grams or 12.1 ozs. Troy. This special flask is 6 1/8" long, 3" wide and 1 1/4" thick, with a capacity of 3/8 pint Monogrammed and inscribed as described above, the soft, warm, original finish is present, with no buffing or machine polishing. The excellent original condition and clear detail, with no removals, repairs or alterations, make this an especially attractive offering. American coin silver ornately engraved cup and saucer, c.1850. The elegant cup has a half round strap handle and its body has overall Rose and Thistle engravings surrounding a large spread winged bird with a Maltese Cross on its chest. The name: Elsi is inscribed above the beak of the bird. The saucer has conforming floral engravings. Weighing a total of 204 grams or 6.5 ozs. Troy, the saucer is 5 1/8" in diameter, with the cup being 2 7/8" tall, 3" in diameter and 4" across the handle. Inscribed as described above, the soft, warm, original finish is present, with no buffing or machine polishing. The excellent original condition and clear detail, with no removals, repairs or alterations, make this an especially attractive offering. 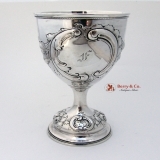 American coin silver goblet having Repousse floral and scroll decorations on the body and pedestal base, with a scroll bordered cartouche containing an ornate, period monogram: F. Weighing 180 grams or 5.8 ozs. Troy, this impressive goblet stands 6" tall and is 3 1/2: in diameter at the rim and 2" in diameter at the base. Monogrammed as described above, the soft, warm, original finish is present, with no buffing or machine polishing. The excellent original condition and clear detail, with no removals, repairs or alterations, make this an especially attractive offering. 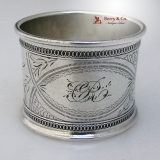 American sterling silver napkin ring with engraved scroll decorations, Gorham Silversmiths, c.1890. 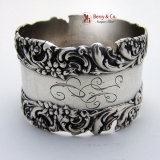 This beautiful napkin ring is 1 7/8" in diameter, 1 1/2" tall and weighs 31 grams or 1 ozs Troy. Monogrammed CR inan ornate period script. The soft, warm, original finish is present, with no buffing or machine polishing. The excellent original condition and clear, crisp detail, with no removals, repairs or alterations, make this an especially attractive offering. American coin silver napkin ring with an engraved moon, branches, bird and diagonal geometric decorations, c.1870. 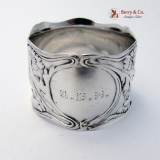 This beautiful napkin ring is 1 3/4" in diameter, 1 3/4" tall and weighs 29 grams. Inscribed 25th Ans. AAB. The soft, warm, original finish is present, with no buffing or machine polishing. The excellent original condition and clear, crisp detail, with no removals, repairs or alterations, make this an especially attractive offering. German 800 standard silver large ornate 9 paneled wild rose napkin ring with engine turned decorations, c.1850 - q860, unmarked but guaranteed to be as represented. Three of the panels are blank, six have engraved, alternating open and closed wave decorations. 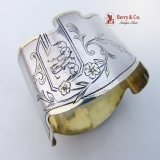 This beautiful napkin ring is 2 1/4" in diameter, 1 7/8" tall and weighs 23 grams. Monogrammed KW in a period script in one of the blank recessed panels The soft, warm, original finish is present, with no buffing or machine polishing. The excellent original condition and clear, crisp detail, with no removals, repairs or alterations, make this an especially attractive offering. Coin silver napkin ring with gold accent on the border and in the floral engraved decorations, c.1900. It is very much in the Russian style and even has a Russian Style monogram, but the ring is not marked. 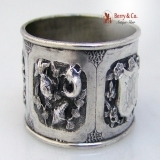 This beautiful napkin ring is 2 1/4" long, 1 3/8" wide, 1 5/8" tall and weighs 31 grams or 1 ozs Troy. Monogrammed HH in an ornate period script. The soft, warm, original finish is present, with no buffing or machine polishing. The excellent original condition and clear, crisp detail, with no removals, repairs or alterations, make this an especially attractive offering. American sterling silver tea strainer in the Repousse pattern by Jenkins & Jenkins, c.1910. 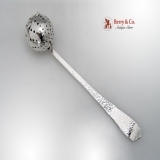 This beautiful tea strainer is 7 5/8" long and weighs 60 grams or 1.9 ozs Troy. The soft, warm, original finish is present, with no buffing or machine polishing. The excellent original condition and clear, crisp detail, with no monograms, removals, repairs or alterations, make this an especially attractive offering. 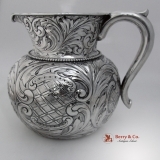 American sterling silver water pitcher with acanthus leaf ornate repousse decorations, Gorham Silversmiths, date marked for 1901. This beautiful pitcher is 7" tall, 7" across the handle and weighs 439 grams or 14.1 ozs Troy. The soft, warm, original finish is present, with no buffing or machine polishing. The excellent original condition and clear, crisp detail, with no monograms, removals, repairs or alterations, make this an especially attractive offering. English sterling silver large ornate open work Mythological paper clip with engine turned background, by Samuel Jacob with a full set of London Hallmarks for 1892. The hinge is clean and tight and the spring action works well. This beautiful clip is 4 1/8" long, 2 7/8" wide and weighs 89 grams or 2.86 ozs Troy. The soft, warm, original finish is present, with no buffing or machine polishing. The excellent original condition and clear, crisp detail, with no monograms, removals, repairs or alterations, make this an especially attractive offering. 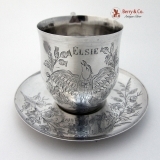 American coin silver child′s cup or mug with applied floral embossed border, made by Taylor and Lawrie retailed by Bailey and Kitchen, Philadelphia c.1845. This beautiful cup is 3 5/8" tall, 3 7/8" across the handle and weighs 100 grams or 3.2 ozs Troy. Inscribed: WW Montgomery 3rd WW Montgomery Jr. WW Montgomery. The Montgomeries were a very distinguished family of Philadelphia lawyers. William w. Montgomery was one of the founders of Montgomery McCracken Walker & Rhoads, LLP. The soft, warm, original finish is present, with no buffing or machine polishing. The excellent original condition and clear, crisp detail, with no removals, repairs or alterations, make this an especially attractive offering. American sterling silver hand hammered tea infuser by W. L. Brennen, c.1950. Each handsome tea infuser is 6 1/4" long and weighs 55 grams or 1.8 ozs Troy. The soft, warm, original finish is present, with no buffing or machine polishing. Monogrammed B on the back of the handle. The excellent original condition and clear, crisp detail, with no removals, repairs or alterations, make this an especially attractive offering. We have two of these available. The price is for one. 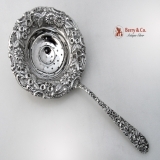 American coin silver large egg spoons in the Gothic pattern by William Gale Silversmiths of New York City, Patent 1847. They come is a fitted box which has some deterioration to the leather covering. Each of these special spoons is 5 1/8" long and the four weigh a total of 81 grams or 2.6 ozs. Troy. The front of each handle as an ornate, period script monogram: GB, while the back of each has an ornate, period script monogram: B Galeâ€²s Gothic has always been a desirable pattern, and we can find no sales record for large egg spoons. Monogrammed as described above, the soft, warm, original finish is present, with no buffing or machine polishing. The excellent original condition and clear detail, with no removals, repairs or alterations, make this an especially attractive offering. 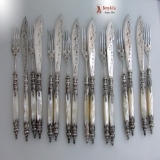 German 800 standard solid silver and Mother of Pearl fish set consisting of 8 forks and 8 knives, c.1880. 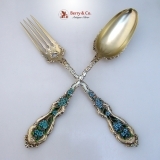 Each knife and fork has a beautiful Mother of Pear l handle with solid silver fittings, blades, shanks and tines with the knives being 8 3/8" long and the forks 7 3/8" long. The soft, warm, original finish is present, with no buffing or machine polishing. The excellent original condition and clear, crisp detail, with no monograms, removals, repairs or alterations, make this an especially attractive offering. 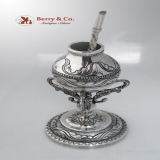 Historical Colonial period silver mate cup masterfully crafted from melted Spanish silver Reales, mined in the New World. This charming colonial piece is hand wrought from coin silver of composition that is completely consistent with this period and age. This beautiful cup has applied gold floral buds. It weighs a substantial 138 grams or 4.4 ozs Troy and is 5" tall, with the three footed base being 3" in diameter. The impressive original condition and crisp detail, with no monograms, removals, repairs or alterations, make this an especially attractive offering. The soft, warm, original finish is present, with no buffing or machine polishing. American sterling silver large ornate gilt salad set with multicolored enamel on each side of this open work floral pattern by Whiting Mfg, c.1880s. Each piece of this beautiful set is 11 1/8" long and the set weighs a total of 220 grams or 7 ozs Troy. The soft, warm, original finish is present, with no buffing or machine polishing. The excellent original condition save for some very minor enamel loss, clear, crisp detail, with no monograms, removals, repairs or alterations, make this an especially attractive offering. 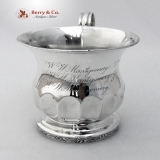 Historical Colonial period silver mate cup masterfully crafted from melted Spanish silver Reales, mined in the New World. This charming colonial piece is hand wrought from coin silver of composition that is completely consistent with this period and age. It weighs a substantial 334 grams or 10.7 ozs Troy and stands 8" tall with a circular base 3 5/8" in diameter. The impressive original condition and crisp detail, with no monograms, removals, repairs or alterations, make this an especially attractive offering. The soft, warm, original finish is present, with no buffing or machine polishing. This handsome cup comes with a complimentary yerba mate straw or bombilla 800 standard silver, c.1950s.